A group of environmental activists campaigning to conserve a forest with some rare species of flora and fauna in northern Armenia is trying to prove that there is an alternative to mining in the area that can provide sustainable livelihoods to the local population. 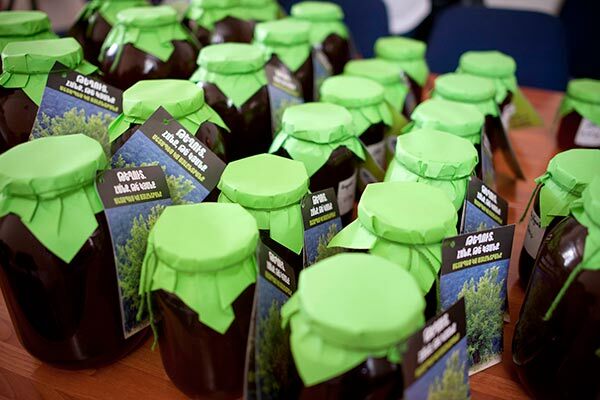 The first attempt of the environmental campaign called “Teghut, a Mine or Life?” has focused on beekeeping as activists have brought the first batch of honey made in Teghut and sold it in Yerevan. Now the group is taking orders for more honey which is available at a price of 3,000 drams per liter or 4,500 drams per kilo (between some $7 and $11). “We always say that by buying Teghut products people help prevent an illegal and destructive mining project. We first collected orders on Facebook. After that we had honey sent over from the Teghut area and gave it a very simple packaging with a green cover, attaching to jars information leaflets about the Teghut issue. We sold honey at the price quoted by farmers,” Lena Nazaryan, a member of the initiative group, told ArmeniaNow. She added that the result was expected for them as people are aware of the Teghut problem - many cannot have a direct involvement in the process but are willing to contribute otherwise. For more than four years environmentalists have been trying to stop the operation of copper-molybdenum mines near the village of Teghut in the Lori province. They say mining activities will cause irreversible damage to the local environment and the Teghut forest. Environmental pressure groups have staged numerous protests and engaged in litigations, but they also have sought to show that it is possible to have environmentally safe business models in the area that will be profitable and will have a long-term prospect at the same time. Nazaryan says they follow three principles in their initiative: they bring only the best goods from Teghut, do not take commissions and do not work only with one villager, as they try to attract all who have good products. After the successful experiment with honey, the environmentalists intend to bring other agricultural products as well: Cornelian cherries, quince, nuts, haw, hip, aveluk, mint, thyme, various berries, etc. They also plan to launch a website, www..market.teghut.am, through which they will be taking orders for products. Optimistic of their campaign, nonetheless, environmentalists refuse to say how much honey they’ve sold so far.